My Copper Bracelet came out beautifully the first time I tumbled it but the 2nd time it turned out dark and looked ugly, dark and tarnished. I used Tarn-X on it and it removed the crud, but removed some of the beautiful shine. I also had a Bright Aluminum Dragonscale bracelet that looked like an ugly old chain link fence after it tumbled for about 6 hours. What happened? Hi Patti! I have to tell you that working is aluminum is something I have zero experience with. Aluminum is quite soft, so it's possible that the steel shot actually gave it a brushed appearance or that there was a chemical reaction between the metal and what it was tumbed in. There are several scenarios that come to mind when reading your post. Tarnex is a no-no! 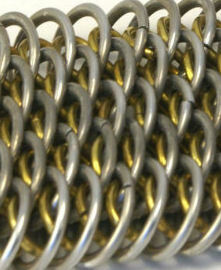 It turns silver an ugly dull yellow requiring lots of polishing and it's not to be used on copper, brass, etc. at all! The metal in your photo looks like brass, not copper. The tumbler is a great tool, but it's not a cure-all and not appropriate for all metals. I don't tumble plated metal as some lose their plating during the process. Also, you must keep the inside of your barrel clean and your shot clean too to prevent any impurities collected there from transferring themselves to what's in the tumbler. What you use to tumble your items is important too. Please read my article called Tumble Polishing in the Tips & Techniques section. I think you may find some insight to what's going wrong and how to get the best results from your tumbler.